It’s anti virus renewal time! Not the most exciting job of the year, which is why I’ve been renewing for at least 2 years at a time. Bottom line: So, after all my research, reading and testing, we’re sticking with Nod32 for another 2 years. We’ve been Eset Nod32 customers a long time, but for this renewal a few warning signs meant extending the licence wasn’t the no brainer it has been in the past. 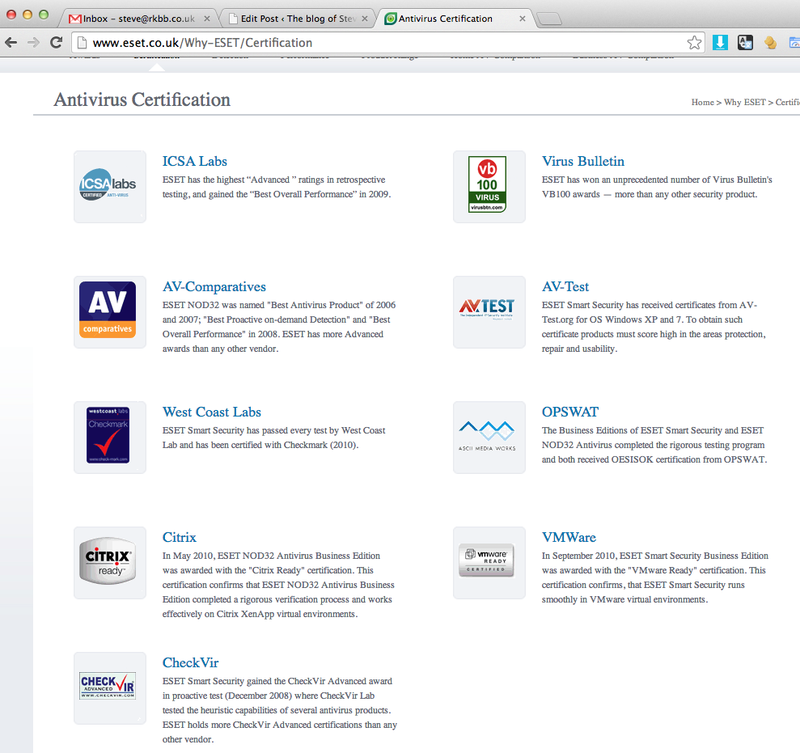 It’s November of 2013, so why are all these certifications dated 2006 to 2010? 2) Being pedantic when it comes to presentation of data, I read the claim of “ESET has won an unprecedented number of Virus Bulletin’s VB100 awards, more than any other security product” can also mean “We’ve been around years longer than everyone else, so we can say that whilst the new companies can’t”. It doesn’t tell me Eset are still leading the field and I’m sure they used to say they were the only provider with a 100% detection rate. They don’t say that now… maybe they’re not as good? The big plus in their favour: The renewal price is cheaper than the new customer price. I like that. I hate it when companies give discounts to new customers but not existing, making me need to spend time switching supplier each year. Despite the plus, it was time to do a little more research. I went through each month of reports on this site, as well as a couple of others. About 4 hours of study (yeah, I should get a life). 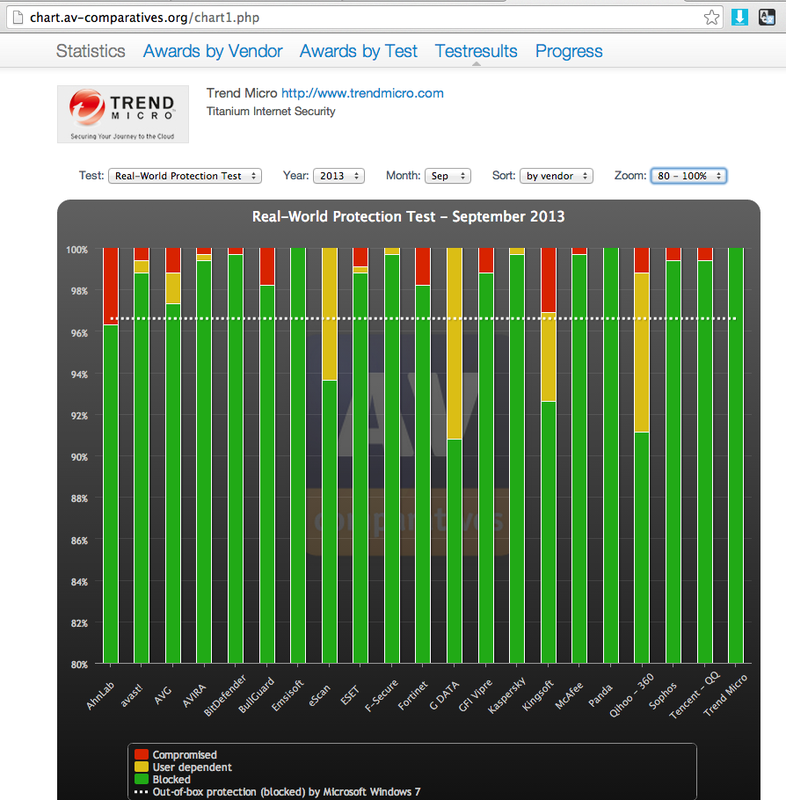 Result, ESET isn’t the leader any more. It may only be behind by a couple of percent, but going through several months of av-comparatives.org tests, they are now often a little behind. My fear, of course, is that one or two new viruses they mis in a given month is the one that gets into our network and causes mayhem [at this point, I am obliged to remind you to make sure you backups work, lest this latest virus called ‘cryptolocker’ destroy your files]. I looked at the new consistant leaders. I settled on the best alternative for our needs to be BitDefender. I wanted to try Kaspersky. Mostly because I admire their stance against a patent troll but unfortunately it’s a lot more expensive than Eset Nod32. Of course, I’ll regret that one day if we get a virus Kaspersky would have stopped, but in 6 months time it could be Kaspersky misses the virus Eset would have stopped. Hey ho! I registered for the trial and at first, I liked it. I went for their ‘Cloud Security’ option, which as best as I can tell, is their ‘Small Business Pack’ (ie: regular PC Antivirus) but with a web based console for reporting and installing. I installed it on a new Windows 8 PC (Our first in the office, and I like Windows 8 a lot) and I love the console. It gave me a link to download the install which was super smooth (no licence ID’s to type in). It later told me that we have 7 other PC’s that aren’t running BitDefender (it searches the Windows network for machine ID’s and matches it to the machines BitDefender is installed upon). Everything was great… until I got a virus. OK, not a real virus, the EICAR test virus file. It’s a small piece of text you can download to see if your virus scanner will detect it. Except. It didn’t. Or, I thought it didn’t. It immediately quarantined the file BUT DIDN’T TELL ME. So I did what any user would do, I tried again. I then decided the download function wasn’t working, so copied the text into a new text file, saved it, closed it – but it had disappeared. I then created the text file and left as .txt. Saw it on my desktop, renamed the file… and it disappeared. Only then did I go and check the notification panel to see all these files were quarantined. So it’s good, it did it’s job, but it’s bad, because I didn’t know that. If one of our users has the same situation trying to read a customer’s .doc attachment, how are they to know what’s happened? It’s annoying. When running in Auto Pilot Mode, the product will take automatic actions for all malware and all information will be logged in Events. So, if you realise, you can open the widget and see what’s happened. It doesn’t pop up a warning. Until then, you’ll be clicking download wondering why nothing seems to be happening. Today, I also noticed a new warning “7 Days since last system scan” or similar. 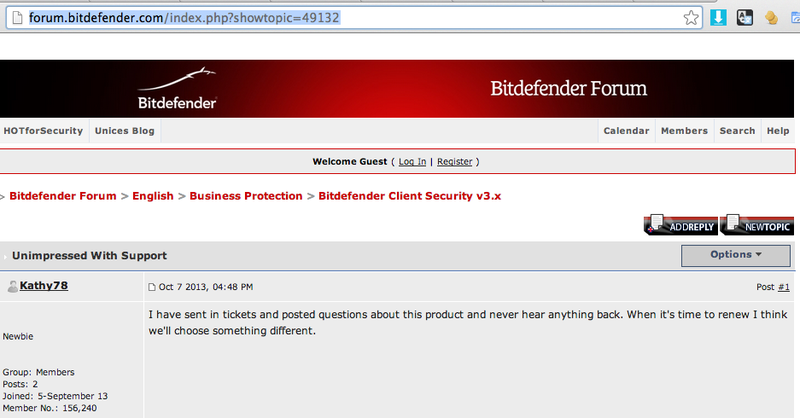 I don’t understand why BitDefender hasn’t just gone ahead and scanned if that is significant to the antivirus protection, I know Eset Nod32 does. Sure, a full scan can affect PC performance so make it happen when the processor is idle, or as a low priority background task. I’ve only put one support request into Nod32 over the years we’ve had it, but looking back it appears to have been answered on the same day (with the solution, my further thank you reply 4 days later shows). So, after all my research, reading and testing, we’re sticking with Nod32 for another 2 years. I’m using Parallels 9 on Mac OS X (Mavericks) to run Windows 7. A couple of days ago I duplicated my Windows 7 virtual machine. Parallels spotted the duplicated machine when it started and offered to create a new MAC address. All looked good. I uninstalled some software but Parallels was still using just as much disk space. Windows said it was using 64GB but Parallels and the folder size in Mac OS X reported 137GB. I wanted that free space back! Thank you for contacting Parallels Desktop Technical Support and taking some time to explain with us the concern. Based on the details that you shared with us. We would like to recommend some troubleshooting steps/article that might help us on solving the concern. Please follow the advanced troubleshooting part of the article below. Warning: We strongly recommend to create a backup copy of your Virtual Machine before applying the solution below! Please take into account the size of virtual machine comparing to free space on Macintosh HD. 5. Press Enter/Return key to run the command and merge the snapshots. Afterwards, please try to shrink the Virtual Hard disk size or compress it.